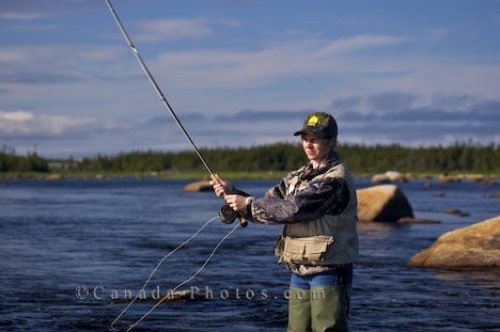 A woman stands in the Salmon River in Newfoundland, Canada casting her fly fishing line in hope of a big catch. Casting is a large part of the technique needed in fly fishing and after a few lessons from the guide, this woman seems to have everything under control standing in the Salmon River in Newfoundland, Canada. All this woman needs on her day of fly fishing as she practices her casting is the proper waders, fishing vest and of course a decent rod with extra lures. Picture of a woman casting her fly fishing line knee deep in the Salmon River near Main Brook, Newfoundland in Canada.